There are so many benefits of yoga for writers. Did you know that yoga can inspire you, train your creative mind, make you more productive, boost your writing abilities, and stop writer’s block? It is in the news today that famous authors are using yoga as a way to improve their writing (see below). And science proves that it works. Convention tries to tell us that only talented people are creative. Creativity is a state of mind that we can train and develop, just like all other states of mind. With the right exercises, we can train the mind to accomplish anything, even to sharpen our prose, improve our fiction, and help you to notice those typos in the letter you just sent to your boss. 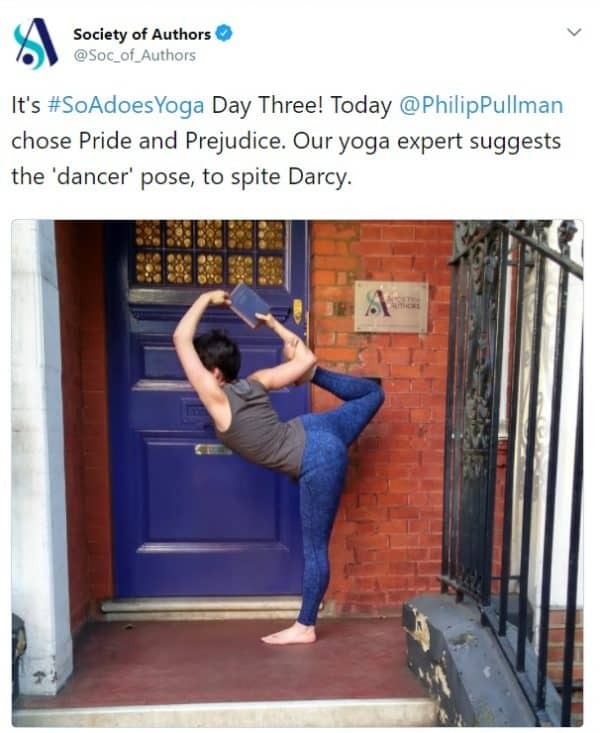 Even famous authors themselves are talking about the benefits of yoga for writers. 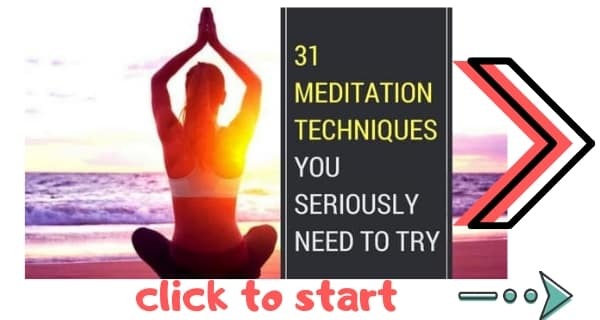 I’m a meditation teacher. So naturally I often teach people how to use meditation to become a creative person. My favorite meditation for writers is mindful writing—it relaxes the mind, raises mindfulness, and improves writing abilities. I’m also a yogi and an author. And I know that as powerful as meditation is for writers, yoga is equality powerful. There are just so many benefits of yoga for writers. Turns out lots of famous authors agree. 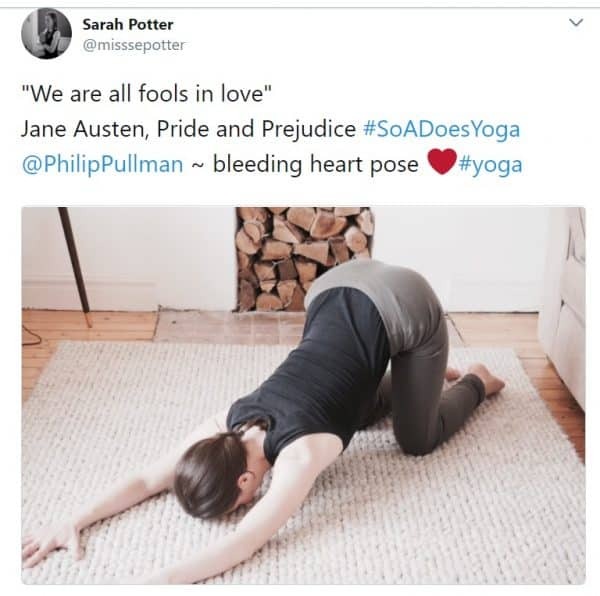 Recently numerous extremely-talented (and very famous) authors have been tweeting their best yoga-selfies. That’s because the Society of Authors has suddenly lept on the yoga bandwagon. The Society of Authors is usually all about arguing over contracts and helping authors to raise money to get their books published (actually, I could use a little help with that myself…). But today the Society of Authors has stepped out of their offices and into the yoga studios. 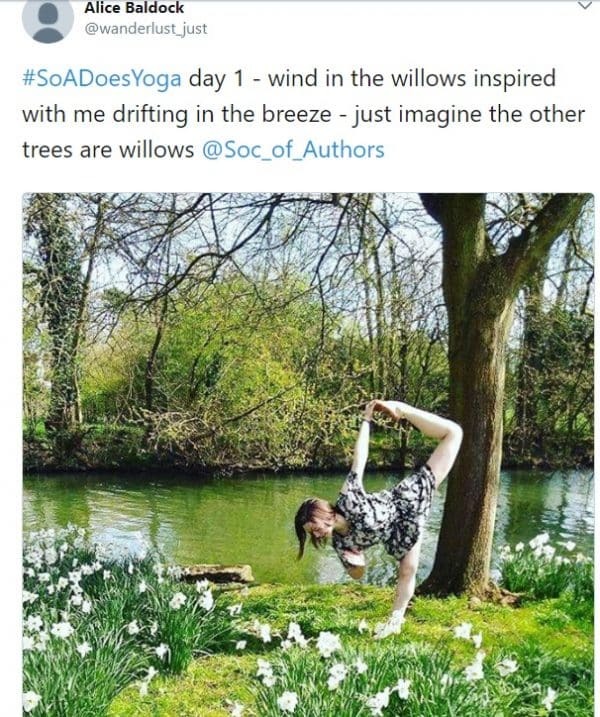 They’ve been challenging authors and book fans to take a yoga-selfie that is inspired by their favorite book. Joanne Harris [author of Chocolat] asked fans for selfies based on The Hobbit. Phillp Pullman [author of the His Dark Materials trilogy] chose Pride and Prejudice. Neil Gaiman [author of Coraline] chose The Hitchhiker’s Guide to the Galaxy. This was just for fun. But science shows that yoga is actually one of the best ways to improve creativity. New to yoga? Check out my guide to the 13 types of yoga. I’ll help you choose which one to do. Or try these crazy alternative styles of yoga. Creativity comes when we are relaxed and at peace. It’s said that you can’t rush art. You’ve just got to surrender to the world and let nature guide you back to your point of creativity. One of the best ways to do that is with Child’s Pose. In this simple pose we relax with the forehead on the floor, our spine long with space between the vertebrae. In this position we breathe and unwind. This restores our flow and let’s creativity return to us. Definitely one of the best yoga poses for writers. Corpse pose is a simple pose in which we are at rest on the ground, lying on our backs. Usually practiced at the end of a yoga session, corpse pose is a moment for meditation. It is surrender. It is being one with the universe. 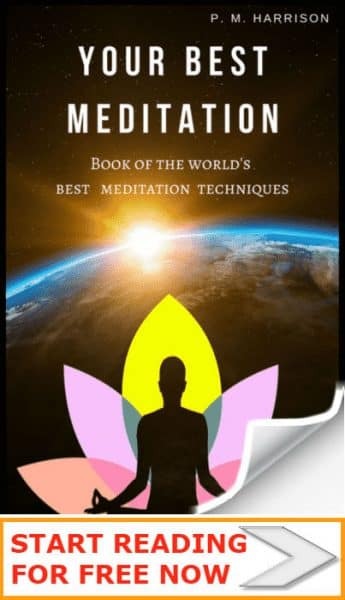 It is deep meditation—precisely the sort of meditation that boosts creativity. This yoga pose helps writers to relax and to refocus their minds. Pigeon pose is a way of liberating the energy reservoirs in the hips. This beautiful pose is a potent way of releasing negative energy. The hips are the seeds of inner creativity. When we relax the hips we open the second chakra, boosting creative energy. If you’re stuck in your writing, hold Pigeon Pose for a few minutes. It will rekindle your creative fires. Closely related to pigeon pose, Eagle Pose also opens the hips to liberate the creative energy in the second chakra (Svadhishthana). It also releases shoulder and neck tension, which undoes a lot of the trouble we writers experience from sitting at the desk for too long. Half Moon Pose is a pose of harmony in which the whole body works together. This wonderful pose produces inner peace and balance. It is a powerful way of opening the mind. This is one of the best yoga poses for writer’s block. Pranayama and meditative breathing are excellent for relaxation and for writer’s block. When we are relaxed and calm the brain produces alpha brainwaves that are conducive to creativity. This will work together with the physical posture to cause a surge in creative energy. The headstand is one of yoga’s best poses for creativity. It stimulates the brain as blood flows to the head. The change of perspective leads to the creation of new thoughts and ideas. This is a wonderful yoga pose for writers who are trying to come up with new ideas. If you’re looking for a form of yoga that will have a big effect on your mind, take a look at my guide to Pratyahara yoga. Pratyahara is a way of reducing negative influences so that we are freer, more productive, and more positive. This has a profound effect on the mind and will help you to get the flow going in your writing. We looked at the best yoga poses for writers above. These asanas are beneficial for body and mind. More than anything, though, the yogic way of life is excellent for writers for many reasons. Here are my top 5 benefits of yoga for writers. Whether you write at work (letters and the sort) or you’re writing a novel at home, as a writer you probably spend a good deal of time sitting in front of a computer. We all know that sitting in front of a computer all day is far from healthy. We need to take breaks for both the body and mind. We need to stretch to get blood flowing again. Otherwise we will suffer numerous health complications. This is why many bosses are advocating yoga at work. Yoga is one of the best exercises to in your breaks. It quickly gets us moving and undoes the damage of a sedentary lifestyle. Tip: Take 15 minute breaks every 2 hours to do some yoga. Mindfulness (see our spiritual-words dictionary) is huge for writers. When we are consciously living in the present moment we are less likely to make typos and other mistakes (grammar, formatting, you name it—there are more than enough errors writers make). And when editing, mindfulness helps us to catch typos and other errors that need to be edited. In other words, yoga helps writers to make less mistakes and to edit their work more accurately. Writing is the combination of creative skills and technical skills. We need technical skills to write accurately and to edit work. We need creative skills to come up with ideas. Science shows yoga boosts creativity. The link above includes a look at many scientific studies that prove that yoga makes writers more creative. And creativity helps writer in myriad ways. Again, for proof of all these points, see the link above. We all know the scenes from Stephen King’s The Shining, when all work and no play makes Jack a dull boy and ultimately drives him insane. For mental health, writers must be able to get away from their work. And this is not always easy. When you are totally engrossed in your character’s live (for novel writers) it can be hard to get out. We need time away from our work in order to a) not go completely insane, and b) to step back and see our work in a new perspective. Yoga refreshes the mind and reduces what Buddhists call “clinging”–which is essentially a mental fixation, the kind of fixation you experience when you’re writing like a mad person desperately trying to complete your work. In other words, yoga helps writers relax and step back from their work. Productivity is essential to most writers. From the office worker with a million letters to write, to the mega-famous author who is pushing out a production line of fiction, we need to take steps to improve productivity. Yoga makes writers more productive in many ways. It keeps us fit so we can stay at peak-performances levels. It helps us come up with new ideas so we actually have things to writers about. It improves our posture (huge for writers because bad posture leads to problems when typing). And it helps our minds to stay relaxed yet focused. Writers who practice yoga for half an hour a day will be much more productive than writers who neglect their bodies as they strive to get more work done. You’ll be fitter and a better writer to boot. The spirit, science, and asanas we’ve looked at in this article will seriously boost your writing skills and your writing career. Write a comment (or scathing review) below. I would like to send you a copy of my new New Age music album in the hope it may be of some use to yourself, your site or your audience. I believe in the power of music to heal and connect. Its called Into the Mist. I would need an email address so I can send you a dropbox link to the music. I’m an Australian pianist and singer known as the Piano Angel. Hi Fiona. Piano hey? I’m a pianist myself and have been for 20 years. So naturally I would love to hear your music. You can email me at [email protected] Thanks.